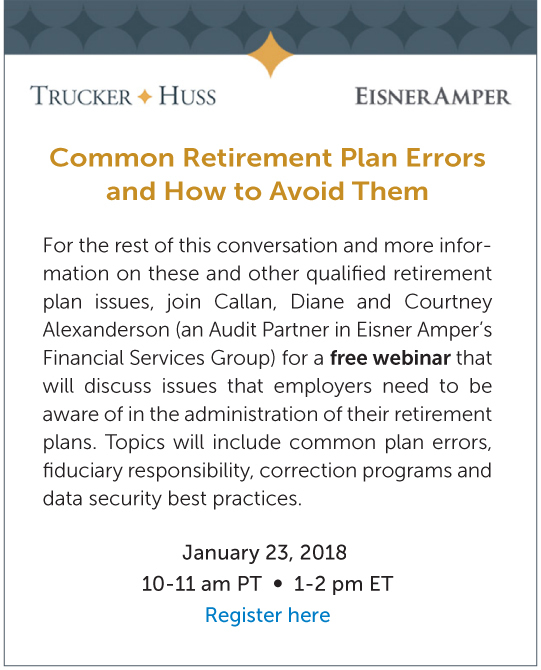 I talked with Diane Wasser of EisnerAmper LLP, a national certified public accounting firm with a practice group specializing in the audit of retirement plans, about common issues that Diane and her team discover during their audits of retirement plans. Diane is the Partner-in-Charge of the firm’s Pension Services Group. She has more than 25 years of experience providing employee benefit plan audit and consulting services to publicly and privately owned entities across the United States, including those registered on the NYSE. Below is an excerpt of our conversation. Diane: The most common operational defect we find when performing plan audits is that employers use incorrect compensation when calculating employee and employer contributions to the plan. Each plan doc­ument defines compensation in a certain way, setting forth which types of compensation are included or excluded from the plan’s definition of “compensation.” Unfor­tun­ately, this definition is often overlooked in the daily operation of the plan and the employer’s payroll. It is also common to see this type of error when an employer adds a new type of compensation and does not consider the impact on the calculation of the employee deferrals and employer contribution. The second most common operational defect we find during plan audits is improper application of the plan’s eligibility provisions, particularly in regard to automatic enrollment and automatic escalation. To increase plan participation rates, many qualified retirement plans include an automatic enrollment feature in their plan design which automatically schedules employees for salary reductions (deferrals) into the plan at a default rate. Some of these plans are designed to increase the automatic contribution rate annually or over some other period of time. These plan design provisions are not, however, always followed. We often find employees who were never automatically set up to make deferrals into the plan or groups of employees whose deferral rates were never increased. Both of these administrative errors are qualification issues. Lastly, another common qualification defect we find during plan audits is the failure of the plan to properly conduct non-discrimination testing, due to the use of incorrect data, including but not limited to taking into account proper compensation (as defined in the plan document). Tests are only as good as the data used to perform them, so it is crucial for the employer to give the plan’s recordkeeper accurate information before they run the testing. If a non-discrimination test (such as an ADP or ACP test) is failed, there is a limited period of time in which the plan administrator must take corrective action so that the plan does ultimately pass the failed test. Callan: As the independent auditor, are there any steps you must take when you find an error? Diane: Yes, in any financial statement audit of a plan, there is a risk assessment process which leads to designing audit procedures to address the noted risks. At the core of auditing is the testing of a sample of the total employee population and then assessing the results of that testing. When a plan error is noted, the auditor must determine how to respond to the error. Responses may include testing a larger sample or obtaining additional information in a particular affected area. With benefit plans, errors carry a broader consequence given the impact that errors can have on a plan’s qualified tax status. Callan: What can plan sponsors do to prevent these and other errors from occurring? Diane: Surround themselves with a highly qualified plan auditor, a knowledgeable plan recordkeeper and ERISA counsel! Fiduciaries should take their role more seriously and review the plan themselves before we start our review process. They should actively read the plan document and amendments, and compare them to the way the plan is actually being operated. Many plan sponsors monitor only the plan’s investments and avoid the more administrative, day-to-day aspects of the plan, which can lead to systemic errors. If the plan sponsor or administrator finds an error, consult with qualified professionals to correct it as soon as possible.